I apologize. I looked around, and I was going to write about something else, I swear I was, but then an article caught my eye... It proclaimed, loudly, that one of England's most famous leaders was a psychopath, and I knew that Winston Churchill would have been counted in that list. Now, as anyone in my history class would know, I have a little bit of a soft spot for good old Winston, and I don't think I could cope with finding out that both of the intelligent men I love are off their rockers (my Grandad being the second one, and I promise you, his insanity was never doubted.). 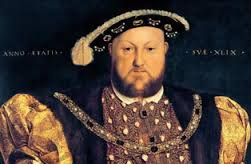 It was with relief that when I clicked on the article (that I can't find at the moment), I saw a massive photo of a massive king: yup, good old Henry. The bloke who's name I can't hear without bursting into an ear-splitting rendition of 'I'm Henery The Eighth I Am'. So, Henry was pretty mental, the experts have decided. Big surprise. I think not. Let's see... 6 wives, 2 divorced, 2 beheaded, a real hatred for heretics, quite an impressive amount of deaths to his name... Well, I can truly say I am surprised by the experts conclusion. If i'm honest, i'm not sure that a test is truly necessary to prove that Henry was a few sandwiches short of a picnic, but then I learn that it's the same test that classified Hitler as insane. I'm sure the producers must be proud of this really ground-breaking research. Interestingly, looking at the list, it looks as though some of the most memorable and 'successful' (in some respects) leaders were insane, or scored very high on the 'insanity scale'. In fact, a lot of them comply with almost Machiavellian ideas of what makes a good leader, making me wonder if maybe he had the right general idea. However, the ruthlessness needed to gain power, doesn't bode well for citizens of that leader. Henry may have scored high on many of the categories needed to become categorized as insane, but lets not forget that before he became leader he was honestly and truly loved by many of the people, just like Hitler. 'My' Churchill, however, raised some eyebrows in rising to power, but undeniably delivered. So there we are. Short, sweet, unfocused. A teachers worst nightmare. But hey, i'm tired, have been looking at the news, and have just started reading 'the Prince'. A lethal combination. Put that with me having spoken to the famous grandparents today, and you're all set for a weird post. Thanks for reading this post for this long! Pirates of the Caribbean is one of my favourite films. I would quite happily sit down any day of the week (preferably with a bag of popcorn) and watch Captain Jack manage to outsmart everyone by acting like an idiot. However, it was only when I was watching it last weekend that I realized that there might be some truth behind the plot. Despite the scenes which are quite blatantly false, *cough* zombie skeleton pirates *cough*, there are some facts about pirate beliefs which are true. An example is the ‘Kraken’- the giant octopus/squid which is in the second film. This creature dates back to around 1752 and there is evidence that similar creatures still exist in the sea today. Furthermore, the goddess ‘Calypso’ who features in films two and three is a further truth in the plot as although her story has been distorted, the fact that she is goddess of the sea remains the same. On the other hand, there are many things which are not pirate beliefs, for instance, the ‘black spot’ which appears on Jack Sparrow’s hand in the ‘Dead Man’s Chest’ as this was originally created by the author Robert Louis Stevenson in ‘Treasure Island’. Additionally, the idea of an organized pirate government (the ‘Brethren of the Coast’) and the ‘Pirate Code’ are also false. Ultimately, it is nice to know that I am doing something productive (i.e. educational) while ‘vegging out’ on the sofa and I now have the perfect excuse to watch it all the time. Savvy? So click on the link below! If you missed the excellent season of BBC documentaries on the Tudors that was on over the last few weeks, many of the programmes have made it onto YouTube. There are a few key links below. You may also find the BBC's Tudors page of interest. Please let us know if any of the links do not work as programmes are often removed from YouTube. Please also tell us if you find anything else of interest and we will add it to the list! Although I haven't got into the same habit of some of the other bloggers of ending my articles with my initials, I reckon it's pretty obvious who I am as my articles seem to carry a familiar theme: the Tudors. Yep, you lucky things, it's me again. And, as some of you brighter buttons may have notice from the title, this article will continue with that trend. If i'm perfectly honest with you, I don't even know why i'm so drawn to the Tudor - my main interest in history is really the 'modern world', but something about them really draws me in. I suppose I probably get it directly from my Nan, who introduced me as a small child to the world of the Tudors, and, being an extremely weird child (not much changes), I was immediately enthralled by them: the 9 year old king Edward (if he could be king at nine, why couldn't I be queen at seven? ), the infamous 'bloody Mary', the first truly popular Tudor Elizabeth, and the impossible king, Henry VII. But, if i'm honest, I was completely enraptured the first time my Nan told me about Henry VIII. On the surface, he doesn't seem like the most stable of people, to say the least, and to be honest with you, I was amazed by a king so fat that apparently he couldn't climb the stairs of his palace. I already warned you I was a weird child... So, here is the story of my favorite Henry, and if the Tudor-related articles are beginning to bore you, blame my Nan. Henry started off with controversy, really. After the death of his brother, instead of looking around for a wife, he just married his brothers widow, which must have looked a little dodgy at the time. The laziness when it came to searching out a suitable lady extended to ruling England, as his close mate Thomas Wolsey basically ruled for him, and was soon elevated to Lord Chancellor, which is pretty nifty job to have, if you ask me. His first battle plans to invade France sunk like a lead balloon as they were both expensive and unsuccessful, but between Henry and Wolsey a Scottish invasion was beaten off, and Henry gained the title 'father of the royal navy', for increasing the navy by ten times. However, at the time, failure to produce a male heir was basically paramount to destroying your dynasty, and poor old Catherine of Aragon wasn't going to be popping out sprogs any more at the age of 40. So, like every great king, Henry decided it was time to get himself a new woman, and divorced Catherine, despite the fact that it didn't gain him any brownie points with anyone. His new woman, he decided, was to be Anne Boleyn, and we all know how THAT ended when she couldn't have the precious son Henry so dearly wanted. So. Wife number two and still no luck... I like to think that a public 'lock of your daughters' memo circulated after Anne Boleyn's neck parted company with her head, although clearly a certain Mr Seymour didn't get one. Wife number three, here we come: you lucky, lucky woman, Jane Seymour. Finally, Jane became pregnant with a son, and it's said that Henry genuinely loved her, so all was calm and peaceful... But obviously that would be boring, so in childbirth Jane Seymour died. Now, we couldn't leave Henry without a woman, could we? Wife Four, Anne of Cleves, who sets a record for Henry's shortest marriage lasting only a few months before Henry divorced her and chopped off the head of Thomas Cromwell, who suggested the match, for good measure. The next lucky woman was Catherine Howard, who was married to Henry during the period in which he was sending armies left right and center with no actual rewards. Henry, who was probably getting a bit bored of only having one wife for over a year, decided that it was about time for the guillotine to be dusted off and used again. Bye bye wife five. So. The last and luckiest of the women. The one who was still married to Henry when he died. Catherine Parr. She acted as a nurse to Henry, and after his death almost faded into the background as he was succeeded by Edward and buried next to Jane Seymour. So there we are. The original womanizer. 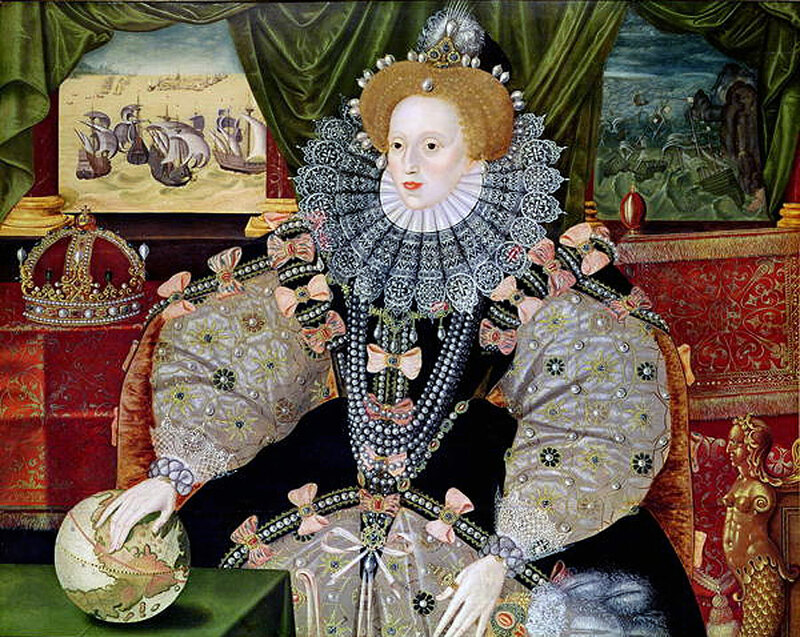 I'd love to be able to tell you that the Tudor thing would stop soon, but I don't lie. So, until next time! 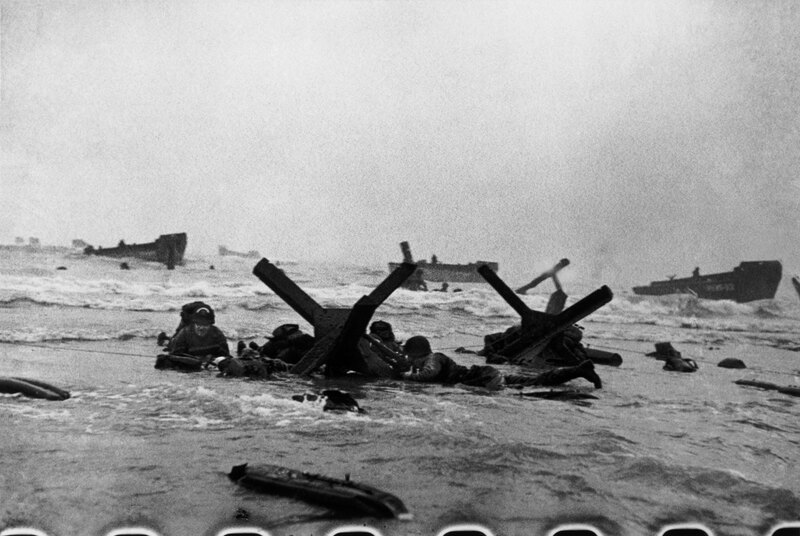 The BBC broadcast over the weekend an excellent documentary on D-Day based as much as possible on first hand accounts from those who were there. You can watch the programmes (before they expire) here and also find lots of helpful content, including a free E-Book (if you own an iPad) with further material and interviews with D-Day veterans. Plans are being put in place to commemorate the 100th anniversary of the outbreak of the First World War next year. The government has promised to invest 50 million pounds in a series of events over 5 years which will be "respectful, thoughtful and useful". A new website has been set up to follow this and there is even a new logo, as you can see below. How do you think it should be commemorated? Here is a debate on the subject between the historian Sir Hew Strachan and writer A L Kennedy who have rather different perspectives on this, and we would like to know what you think... In the meantime you may find this quiz from The Guardian of interest, but be warned, it's rather hard! William Tyndale- The Most Dangerous Man in Tudor England? As is seeming to become a trend for me, the other day after 'Waterloo Road', I decided that I may as well give another BBC historical programme a chance. Slightly worried that this was to be a permanent change, I flicked over to BBC 2 to watch 'The Most Dangerous Man in Tudor England', assuming of course that the mystery man would be someone like my good mate Henry VIII, or at least someone I'd heard of. But of course, I was to be proved wrong. The most dangerous man in Tudor England is, according to the gentleman on the BBC, William Tyndale. Melvyn Bragg stared out at me from my television and very knowledgeably told me that the reason I had never heard of Tyndale is because he had most probably been 'written out of history', making me feel ever so slightly less ignorant than Katie Price. So, who is this mysterious William Tyndale I've been banging on about for the last 148 words, I hear you ask. Well, today is your lucky day. Because I'm about to tell you in as little words with as little waffle as humanly possible. 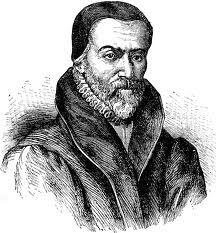 William Tyndale is the man who translated the Bible into English. Doesn't seem like a lot, does it? Not on face value. But Henry VIII was (unsurprisingly) a little but miffed by this. You see, religion, at the time, was the best way to control the population, and as long as only the ruling class know what was said in the Bible,they could make up all manner of things for their benefit and pass it off as the word of God. Sneaky. So that's exactly what Henry and his mates did. Kept the Bible in Latin, and told everybody that if they wished to get into heaven and avoid a life of pain, they must obey the Catholic Hierarchy. Not true. But of course, if you cannot read the Bible to prove this wrong, then you only know to follow the Roman Catholic laws of that time. Tyndale, being a very clever bloke, decided that this wasn't right, and that he was the one to translate the Bible into English and make it accessible for all. Now, in the 16th century, even to attempt a translation of the Bible would result in an early death, and (let's be honest), I don't think anyone would expect Henry VIII to be merciful. Tyndale dreamed as a boy of attempting this extraordinary feat, but his dreams only became something possible during he education at Oxford, in which he learned of a Dutch Scholar, Erasmus, who had translated the Bible into Greek as a result of his belief that to get to the truth of a text, you had to study it in its original language. Tyndale was inspired. 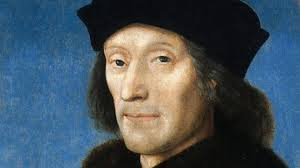 He then became aware of a German monk, Luther, who had translated the Bible and proved that the Church was not the only was into heaven, and idea that Henry VII vehemently slated, gaining him the title 'Defender of the Faith'. This title just enlarged his already massive ego, causing him to view himself as the Pope's avenging sword against these new ideas, which wasn't exactly was Tyndale needed. In was in Tyndale's first post as a chaplain that he began to ruffle some feathers by arguing with clergymen, his determination to translate the Bible into English showing through. Knowing that this would probably come round to bite him, Tyndale left for London to try and find a patron in order to achieve his dreams, and found Cuthbert Tunstalll, bishop of London. Now, I know that Tyndale was a smart bloke, but this was a pretty bad idea. Tunstall hated Luther as much as Henry VIII, and wanted to get rid of heretics as much as Thomas Moore. Not a great idea to go to him. Eventually, Tyndale clocked on to the fact that London probably wasn't the best place to try and achieve his dream, so he left for Germany, Luther's home. It was the last time he would see England. I don't need to tell you that Tyndale was successful- the Bible is in English all over the place now, and I doubt I need to tell you that Henry VIII wasn't particularly happy about his success. Eventually Tyndale was found and burned at the stake. So, there's the basic story of William Tyndale. Wasn't that fun? If you want to hear a professional tell the same story, but better I suggest you click on this link. You'll like it, I promise! (Update) The link above is from the BBC, but the programme is not on iPlayer at the moment. However it is currently available on YouTube here and you may also enjoy this appreciation of Tyndale from The Economist. Every Wednesday, I help out at a ‘Brownies’ pack which is unfortunately closing down in the near future. As a result, last week, the Brownie Leaders and I were clearing out the cupboards. 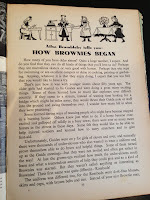 On doing this, I found “The Brownies’ Annual” which had been tucked away at the back for around 50 years. Published in 1959, the pages of this book had been coloured with age which added to its already fragile appearance. 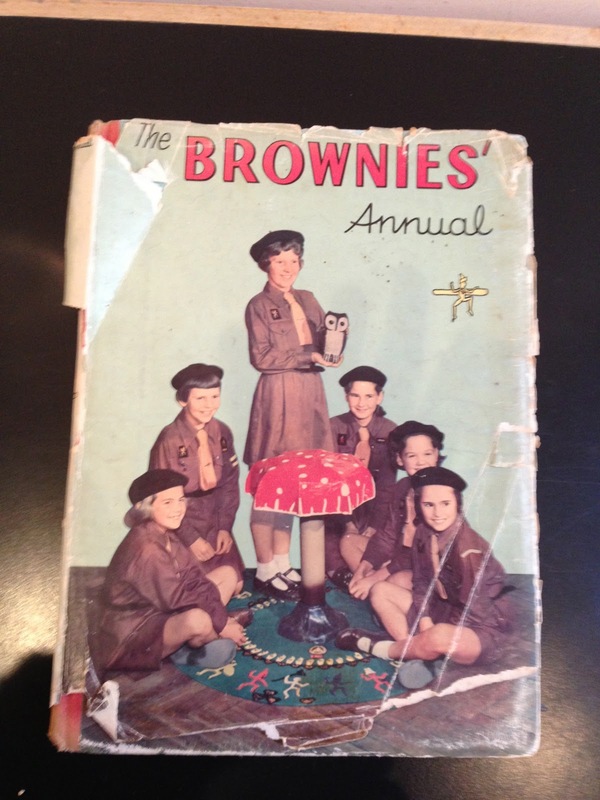 As I was previously a Brownie myself, this book immediately gained a place near to my heart. 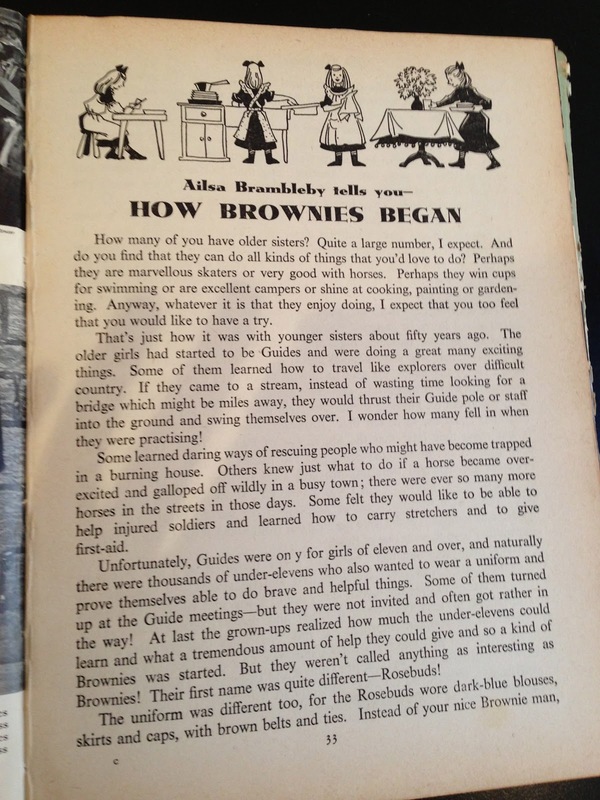 It is filled with old-fashioned stories about how Brownies began and has pictures of Brownies from 1919. 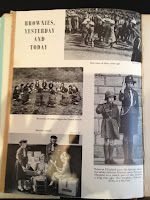 There is even a picture of the Queen in her Brownies uniform! I could go on about the puzzles and activities and poems and craft ideas, however, if I did that, this blog would begin to seem like a transcript from ‘The Antiques Roadshow’, so instead I will tell you a little bit about the origins of this GirlGuiding group. Next year, Brownies will be celebrating their 100th anniversary. It all started when Lord Baden-Powell set up the group in 1914 in order to give girls between the ages of 7 and 11 the opportunity of Scouting. They were originally called ‘Rosebuds’ and were run by the sister of Lord Baden-Powell: Agnes Baden-Powell. However, ‘Rosebuds’ soon became Brownies (named after the book “The Brownies” by Juliana Horatia Ewing ) when multiple girls complained about the name. 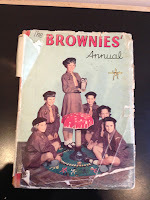 Altogether, although Brownie groups everywhere have become more modernized, it is safe to say that the attitudes of the Brownies have remained the same! If you're anything like me (which I hope for your sake you're not), you'd have noticed while flicking through the channels recently that there seems to be a new found love of the Tudors when it comes to Television producers. Normally, when I notice a sudden influx of popularity for a period of History, I tell myself I'll watch the educational shows 'later', and instead watch something equally intellectual as 'Made in Chelsea' or 'Waterloo Road'. But, in an occasion as rare as seeing Boris Johnson seem vaguely sane, the other day I decided to plonk myself on the sofa with a nice big bowl of popcorn to watch 'Henry VII:Winter King'. I have to say, I was pleasantly surprised. Of course, it started in true BBC style, with swords being sharpened dramatically and words with little sense appearing on screen in white, before cutting to Thomas Penn docking on the very same Pembrokeshire coast that the winter king himself once trod on. However, after a while of over-dramatics I became glued to the scree,enthralled by a man who seemingly had very little claim to the throne of England, and very little chance of winning it, but against all odds managed to become King of England. begun to move his army to meet Henry's. He had no choice but to turn and fight. On the morning of 22nd August 1485, Henry advanced his army to meet the much larger army of Richard III, in a battle that was to become famous. Richard, seeing that Henry's forces were fragmented, advanced, and the two men fought nose to nose, Henry's standard bearer being cut down in the battle. It was at this moment that Lord Stanley clinched a win for Henry. He had been waiting, watching the battle as he chose which side to support- he only wished to support a winner- and decided to fight for Henry in a decision that would become fateful for Richard III. Richard apparently fought bravely, but could not win once Lord Stanley had joined the battle, and was viciously killed. It was this victory that would lead to one of England's most memorable monarchies, and a particularly rich period in our history. (Update) The Winter King is currently available on YouTube here. There's also a handy BBC page here with links to interesting web pages and radio programmes. Thomas Penn's Book "Winter King: The Dawn of Tudor England" is reviewed here. The description of UKIP by John Martin, president of the Edinburgh College Students Association, will no doubt, still be ringing in the ears of Nigel Farage after his hostile reception on what he had hoped would be a continuation of the sudden influx of support experienced in England; recently winning over 140 seats and emerging on the national stage of British politics. 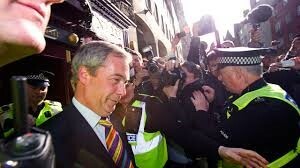 But Farage's expectations were to be greatly disappointed, as he was escorted from the Canons’ Gait pub in Scotland by police to protect him from a crowd of irate student demonstrators , many of whom believe that UKIP have been "spouting racist, sexist and homophobic bile" for months "without challenge". by racial hatred rather than differing political ideologies, stressing the belief that the protesters were "filled with a total and utter hatred of the English". Although not directly blaming the Scottish National Party, (SNP) for the actions of the protesters, he reported to the press that the majority of the activists seemed to be supporters of the SNP, and that he would like to see “Alex Salmond come out and condemn this sort of behaviour. I challenge him today to do that.” He then went on to say that "If anybody from UKIP says anything on Facebook that is in any way homophobic or mildly racist you guys jump down my throat and demand I condemn them and expel them from the party, which of course I do. It is about time Scottish nationalism was put under the same level of scrutiny." However, for the most part the activists have come from one of two organisations- The Radical Independence Campaign, who says that there had been "no anti-English protest", and the Edinburgh College Students' Association, who also claim that the demonstration was in no way connected to Scottish Nationalism, and was rather ‘’ out of a belief that UKIP's policies are fundamentally rotten’’. As far as I am aware, at no point have either of these parties stated to the press that the demonstration was, in fact, connected to the argument for Scottish Independence as Mr Farage has stated. In conclusion, despite UKIP’s success in England, causing many people to say that England is now operating under ‘Four party politics’, and the fact that they pushed the Liberal Democrats into fourth place for the projected national share of the vote, similar success in Scotland is unlikely in the near future. In fact, the most pressing issue in Scottish politics of late is not that of UKIPs popularity, but rather that of Scottish independence.